These houses are now availiable, and will not last long. 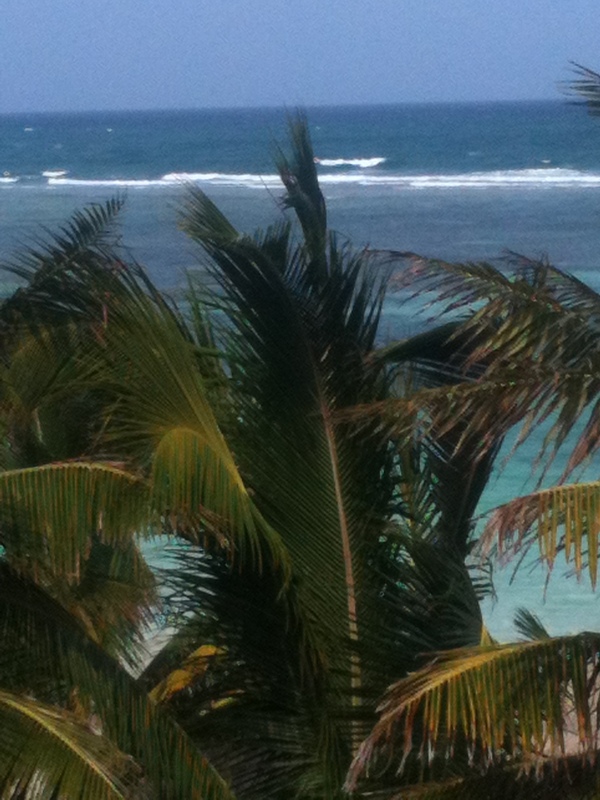 I am back in Mahahual now, so it is time to get back to business. I met with my boss yesterday to catch up on what is going on in the real estate market here in Mahahual. 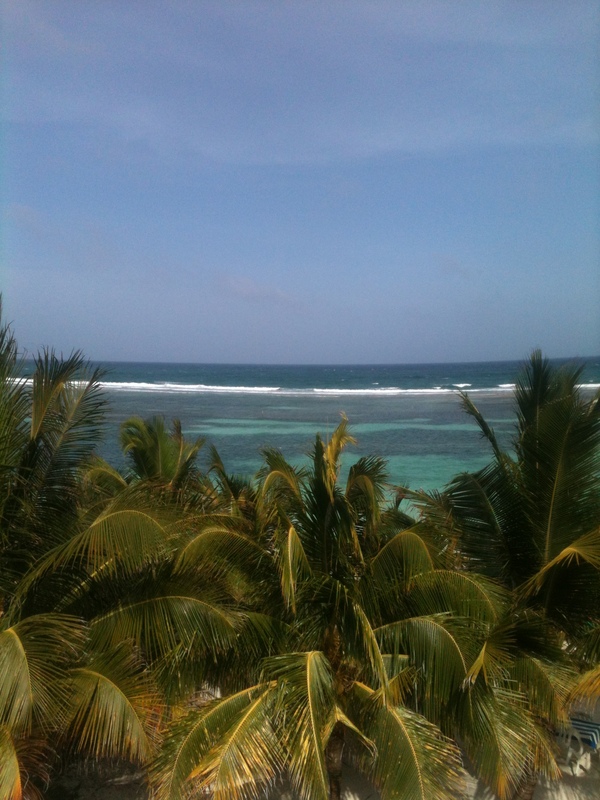 We got lots for sale in Mahahual, and he informed me two houses have just became availiable. These are the standard 2 bedroom houses you find all over New Mahahual, (Casitas as the locals call it), kitchen, 1 bathroom, and a back yard for a garden. They sit on lots of 300 square meters, and have room for parking in front. I noticed one of them had air conditioning, and a new kitchen. Today I am going to answer some questions and share some comments I have gotten recently from blog readers. I will post the questions then answer. This is a great question and I get it all the time. First of all, Chetumal is not an international airport, and to get to Chetumal from the USA or Canada, you have to fly into Mexico City and then catch a flight to Chetumal, and then take the bus here. This adds about 8 hours of flight time to your trip from the USA, and it is quite expensive. 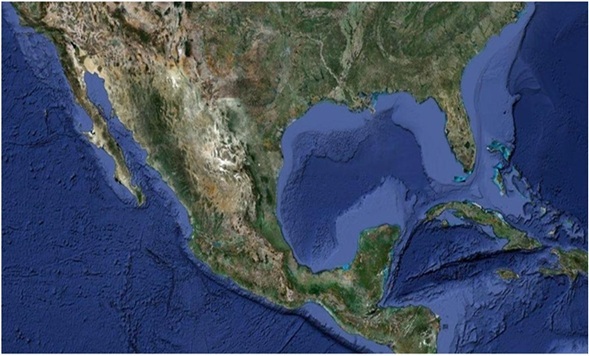 You cannot fly into Chetumal from Cancun. Most major cities in the USA and Canada have daily flights to Cancun and most of the time the rates are pretty inexpensive. For instance you can fly from Atlanta, Ga. or Charlotte, NC to Cancun for around $250 USD round trip. And the flight time is usually 2 hours. A lot of people fly out of Miami, Fla. and Houston TX to Cancun for even cheaper than that. It is also my understanding that flights out of Mexico City to Chetumal also are very expensive. I met a woman last week who flew into Mexico City and then to Chetumal, and she said it cost more to fly to Chetumal from Mexico City than for her to fly to the USA from Mexico City. 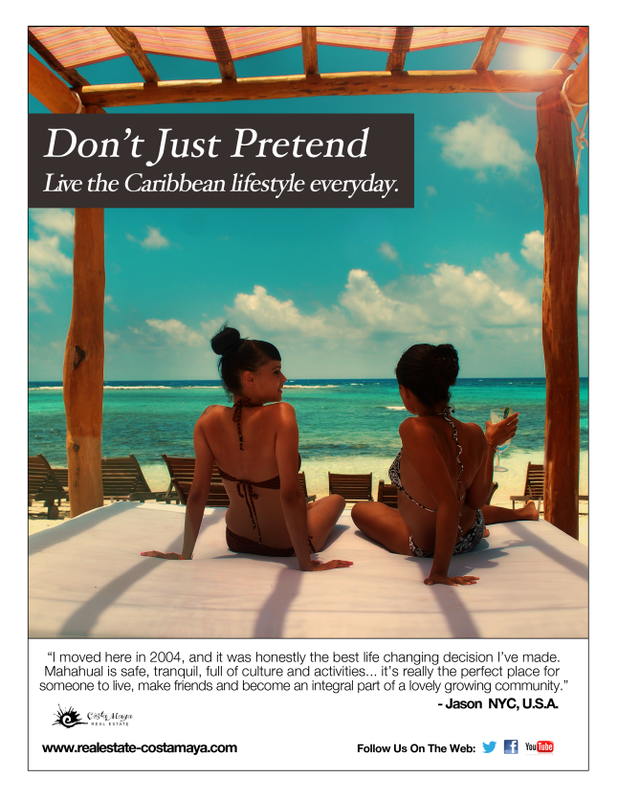 Also, almost all of the expats who live in Belize fly into Cancun when they go to or come back from the USA and Canada. It is also very expensive to fly into the Belize airport from the USA and Canada (almost 3 times the price of flying into Cancun). They fly into Cancun and take the bus down to Belize. The last time I checked the ADO direct bus to Belize City from Playa del Carmen it was 565 pesos, that is about $38 USD. Cancun is 4 hours away from Mahahual, and there are several different options on how to get here. Besides the ADO bus, there are several new companies that are starting up shuttle services here, so you can get here in one day. I have written about these in the past, you can see these in the blog archives. Go to http://www.ahhhmahahual.wordpress.com and there are a couple of transportation services listed there. Another one of my blog readers that arrived here Friday night, took one of these shuttles down and it cost him around $70 USD I think. He liked it and he said it was comfortable, and they even stopped for beer and cigs for him. So to answer the question, that is why I do not recommend the average tourist to fly into Chetumal and then bus over to Mahahual. Cancun is a lot cheaper and the flights are usually no more than 2 or 3 hours long, and they come every day and all day from the USA and Canada. Also the ride down to Mahahual is not bad, only one road, and you can see some things on your trip, and even sometimes stop and take it all in. Cost and convience is the answer, and time. Now if you are flithy rich and have a lot of time and money, then of course fly into Chetumal and take the bus or taxi here, and then come take me out for dinner, and I will order lobster. This question is easy, anywhere on the malecon. Right now there are numerous places availiable in the hotels and condos on the beach in town. It is where I live, and everybody who comes here to see me, I get them to stay in one of the hotels or cabanas here. I could list a bunch of places, but from my experience most are good and not too pricey. If you want my personal favorites hit me up on Facebook or send me a personal email. It all depends on how much you want to pay. I know there are also a lot of nice eco-resorts and boutique hotels north and south of town, but for me the malecon is the place to be, your first time here. One of my blog readers is staying at the El Holito on the malecon, and he likes it, he just walks up and down the malecon when he wants something to eat or drink. And now a couple of comments I have gotten recently. “Love the authentic food there! One of my favorites is the old man on the tric that sells tamales at the port. Love his chicarron tamales and hot sauce. OMG wish I had some right now! “Stewart, I stumbled across your website by accident and really appreciate the history that you’ve posted. Other postings about experts and “How to pee off a Mexican” had me laughing so hard! Those were some positive comments, so to be fair and in the spirit of good play I will now share some negative comments I have gotten lately, from Americans of course. So I hoped you liked todays questions and comments, positive and negative. I get called a redneck a lot from some Americans and expats here, and on my blog. (like that is really supposed to bother me?) I know my ancestors did not come over on the Mayflower. I am still very surprised at how popular this blog has become. 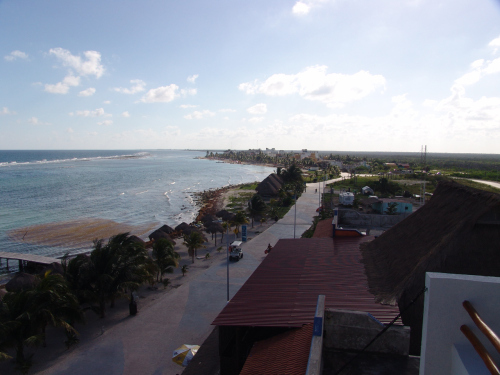 When I first started it, I had no idea of the impact a blog can have on a place like Mahahual. More and more I have people coming up to me and telling me they read my blog here. Last night was a good example. It was getting dark and I was sitting there, it had been a slow day, only some Europeans and a couple of Americans on the beach all day. It is slow now because it is at the end of high season and no cruise ship in town this week, one next week. I was bored and I was about to go upstairs and call it a night and watch some TV, or read some. I looked up and saw this guy walk by in a Harley-Davidson t-shirt and he kind of looked over and kept walking, and kind of stopped and looked over his shoulder. He had grey hair and a beard, and I knew he was an American. He stopped at the corner of the malecon, and looked down and looked like he was checking something on his phone. I figured he was lost or looking for an ATM machine or something. So I got up and went over and asked him if he was looking for anything, and asked him if he was from the USA. He said he was from New Mexico, and had just got into town. I asked him what brought him to Mahahual, and he looked me and said, “You”. He told me he had been reading my blog for 2 or 3 years now, and decided to come check Mahahual out. He said he has been going to Isla Mujeres for the last 10 years. He said Isla now is full of tourists and he wants to live somewhere more quiet and off the beaten path. He told me he had five or six more years until retirement, and then he was leaving the USA, and settling and retiring somewhere in Mexico. He came to look at Mahahual because he had read about it on my blog. We sat down at the Tropicante and had a few beers, and he had some cerviche and we talked about Mexico and Mahahual. He, like a lot of other people our age is looking to retire and find his own paradise. 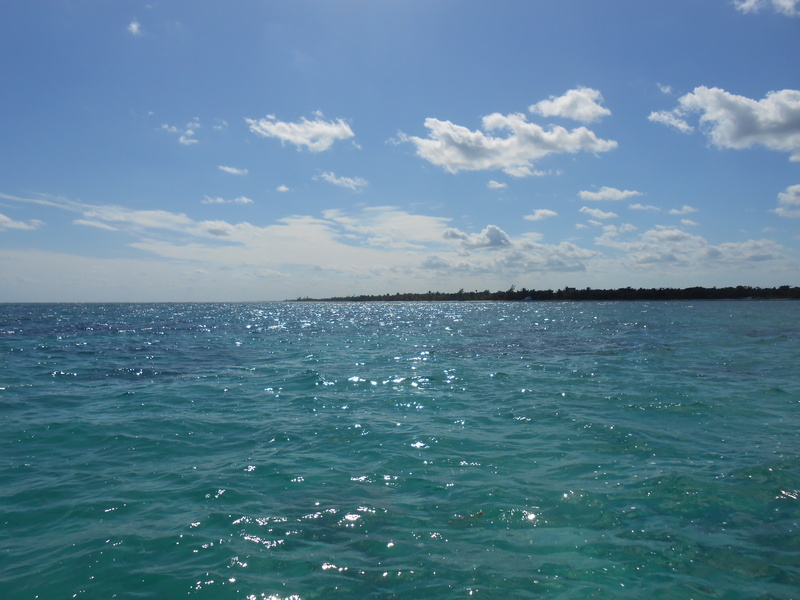 He said that used to be Isla Mujeres, but all that is changed. He told me how it was there 10 years ago, and Mahahual reminds him of how Isla was back then. There is a certain kind of expat, me for one, who likes to live in the out of the way places, and not surrounded by tourists all day and night. I told him that is what I like about Mahahual, cruise ships leave at 4 or 5pm each day and Mahahual becomes a quaint and tranquil place again. I had nothing to do, so I offered to show him around the malecon and the night life on a Friday night here. He met Steve and Maggie and everybody from the Tropicante. After the Tropicante closed, I decided to take him up the malecon to the Ibiza Sunset to show him the place, and meet Karla and Jackie. He is staying at the El Holito at the end of the malecon, so I was showing him some places on the malecon and different places to eat or drink. We had a couple of beers and talked to the girls at Ibiza Sunset, trust me they are quite entertaing. What I like to do when people come to Mahahual to visit me, or look around, I always take them around to meet some of the locals to get different feedback from other people about Mahahual, not just my opinion or insight. As we were sitting there at the swing bar, right on the beach, he turned to me and said, “I could live here”. I said I know, now you know why I am here. Well after leaving Ibiza we left and walked back up the malecon to the Blue Kay, they were having karoake there that night. I thought he might enjoy seeing Mexican karoake, to end the night. We watched karaoke there for an hour or so. It was getting late and he had been up since 3am traveling so he wanted to go to his room and get some sleep. It was about 1am and we walked back down the malecon by ourselves to his hotel, and he was surprised how safe and quiet it was here at night. I am never afraid walking around by myself at night I told him. He went to his hotel and we said goodnight. I am supposed to meet up with him and show him the beaches and the town today. He also wants to ask about maybe retiring here in the next 4 or 5 years, and what are the costs, etc. I told him no problem, trust me I have nothing to do this weekend, everybody is in Chetumal at a wedding, and I got nothing but time this weekend. This is just an example of one blog reader that has looked me up in Mahahual, and I got a feeling there is going to be many more. I found this article from the huffingtonpost.com, and I thought I would share today. It goes into detail why Mexico is becoming such a popular retirement destination for USA and Canadian expats. There are expecting a big increase in retirees here in Quintana Roo in the next ten years. Mexico is one of the biggest and most diverse countries around. There really is something for everyone … lovely, temperate-climate mountain towns, a vibrant Renaissance-like capital city, rainforests and farmlands and yes, those absolutely gorgeous beaches. Today, more U.S. and Canadian expats live in Mexico than anyplace else in the world — as many as a million of them, it’s said. There are many reasons for that, including the vibrant culture, an affordable cost of living and excellent healthcare. Lake Chapala, in central Mexico, is often called the world’s largest foreign retirement community, with up to 16,000 or more U.S. and Canadian retirees in residence, depending on the season. The large expat community means you’ll have a built-in support network as well as access to all the familiar products and brands from home. The 30-mile long freshwater lake is the largest in Mexico and provides cool breezes for this area, considered by many to have the best weather in the world. Being just an hour south of Mexico’s second-largest city of Guadalajara, internationally known for its teaching hospitals, you can also count on world-class healthcare. Guanajuato is a university town and has a fun, youthful feel to it. It’s known for its cultural activities. Every fall, the International Cervantino Festival is held here and brings performers from around the world. But you can find an abundance of art, theater, live music and more in Guanajuato any day of the week. Still, this city remains largely undiscovered by expats — only about a thousand or so call Guanajuato home. If you’re looking for convenience, and a quality lifestyle, gorgeous Puerto Vallarta, on the Pacific Coast and the huge Bay of Banderas, is your place. You’ll find everything you might want here, including direct flight connections to many destinations in the U.S. and Canada. And if you’re not a fan of big cities, head north to small idyllic beach towns like Sayulita, where the laid-back lifestyle can’t be beat. You’ll find a good number of foreign residents all along this coast, called the Costa Nayarit. The Riviera Maya, on Mexico’s Caribbean Coast, is very popular — and the beaches are among the most beautiful in the world. Cancun is a huge tourist destination. And, increasingly, so are Playa del Carmen and Tulum. But plenty of expats live on the Riviera Maya full-time. Cancun and Playa del Carmen, especially, offer shopping, cinemas, major hospitals, and other amenities. And Cancun has the international airport — every airline flies to Cancun. The truth is that Mexico offers an endless number of places where you might want to live, and we’ve only scratched the surface here. If you’re looking for an overseas retirement destination that’s conveniently close to home, and that offers a high quality of life, a rich culture, and a relaxed atmosphere … put Mexico on your list. 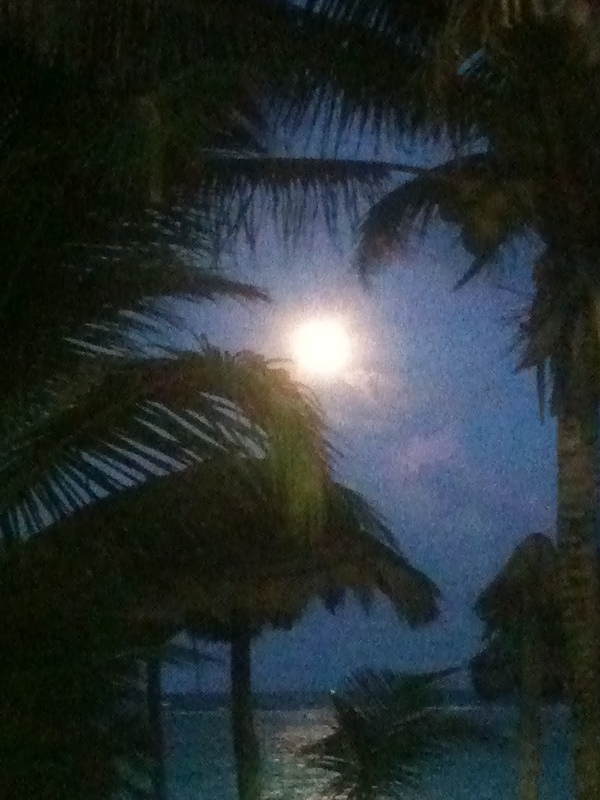 Full moon rising on the Caribbean. I know Mahahual is not mentioned in this article because it is too small, but Mahahual has much of the same appeal as any other place in Mexico to retire. Beautiful beaches, nice people, low cost of living, and now the USA dollar is very strong here. I know I am retiring here. Sometimes I just stand on the malecon and watch flocks of frigate birds fly overhead. 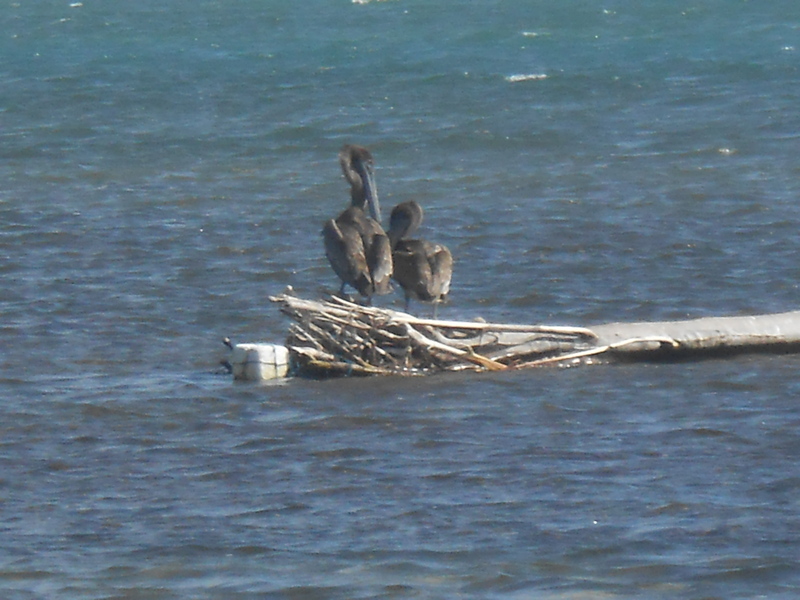 I also just sit and watch the birds diving down to get fish, and the whole rountine of how they circle before diving. Everyday I am reminded of beautiful nature and the Earth is. 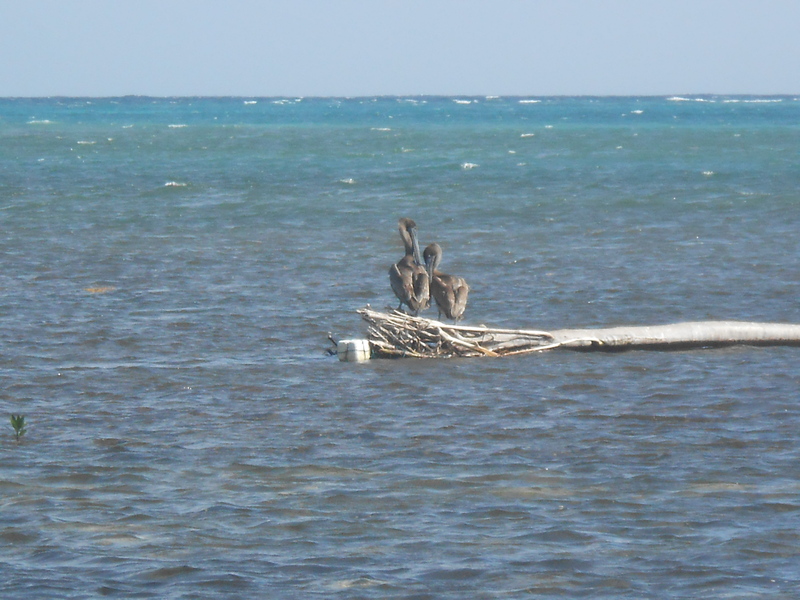 So in honor of Earth Day, here are some of my photos of life here on the Caribbean. My view from my roof. 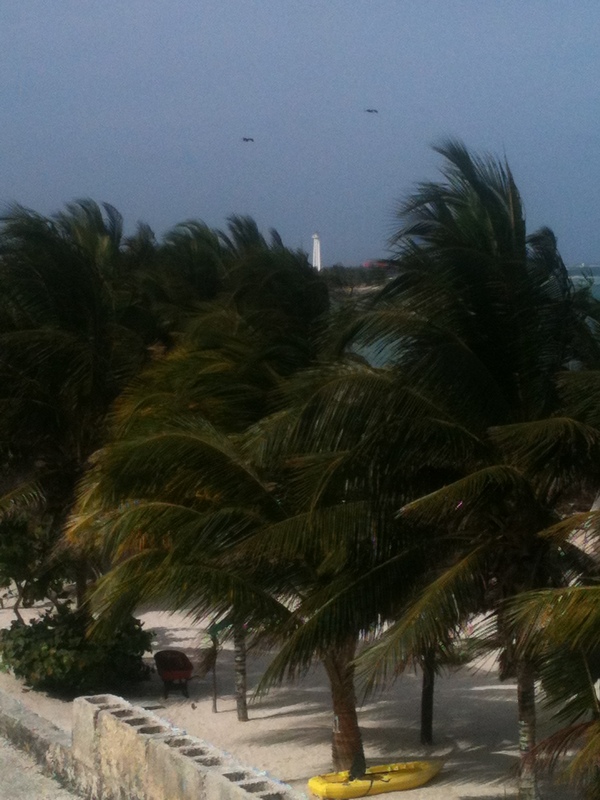 Mahahual lighthouse in background through palm trees. The reef right out front. In honor of Earth Day, students from Chetumal were in town picking up trash on the malecon and beaches. You feel like you can reach out touch the moon here. 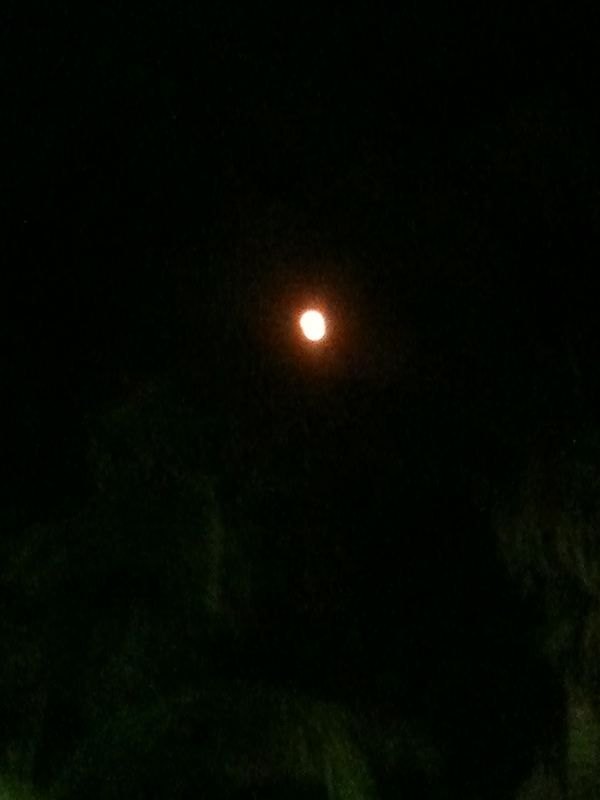 The next night, a red moon. The water is so blue here. Another way to get to Mahahual. 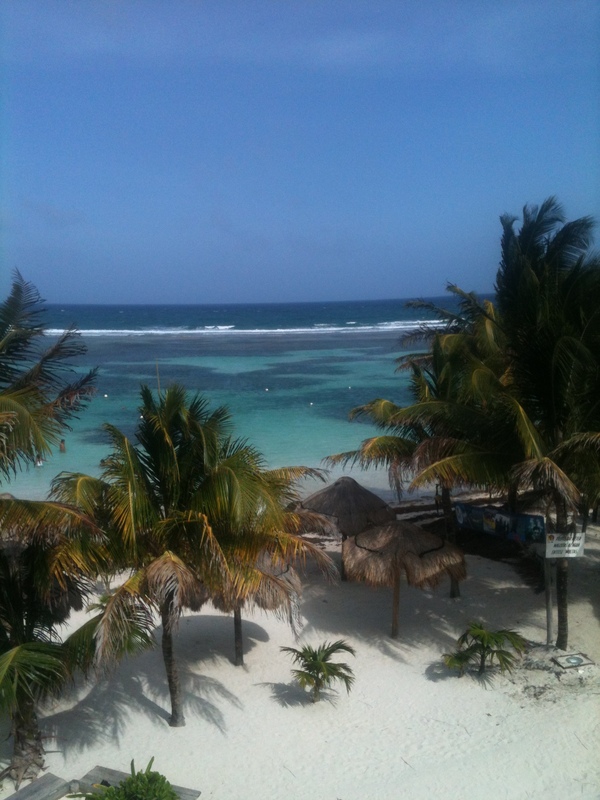 High season in Mahahual and Costa Maya is officially over. Last Friday was the last 2 cruise ship day of the season. There is a cruise ship here on April 30, and two in May, but besides that not much going on in the cruise ship department. Also all the “Snow Birds” are packing up and moving north, and some have already gone back. Last 2 ship day of 2014-2015 season, last Friday. So Mahahual has gotten real quiet over the past weekend, and a lot of the people that work and live in Mahahual during cruise ship season are also packing up and going home to their respective homes and villages throughout Mexico. A lot of the tour guides that work at the port head to different parts of Mexico and conduct tours there. Also a lot of the vendors head to Playa del Carmen, Cancun, or Cozumel, and work there during the summer months here. I have heard that the port is taking the opportunity during the low season here to do some renovations and upgrading to the port. Also there is going to be a lot of concentration on getting the water park open, and provide access from the port to the water park. I am not sure of all the details, but I will try to find out as much information about this as I can, and I will share later when I have more about this subject. So there is going to a lot of activity and changes going on in Mahahual this summer. A lot of emphasis also during this low season will be to concentrate on attracting tourists to the hotels and beaches here during the summer. During Semana Santa this year, I saw a lot of Mexican tourists from all over Mexico, and even some from Belize. I think when these people go back to their homes and cities and tell people how pristine and beautiful the beaches are here, that also will encourage tourists to come here. This time of year is interesting here, it seems like as soon as cruise ship and high season ends, European season starts here in Mahahual. I have noticed this over the past week. This past week and weekend, I have met people from France, Czech Republic, Switzerland, Germany, and Austria. I call this time of year “European Hippie Back Pack Season” here in Mahahual. The hostels here fill up with backpackers from Europe who seem to arrive in April and May, and travel around Mexico and Central American during the summer. Each year it seems like I have seen an increase in Europeans traveling here, and it has started already. I lot of these Europeans I meet here, are in Mahahual for the first time, and they all marvel about how quaint and beautiful Mahahual is. I met a couple of young women from Germany the other day on the beach here, and I showed them around and went to dinner with them at the Ibiza Sunset, and they could not stop talking about how much they loved the beaches here. My two German friends at dinner at Ibiza Sunset. 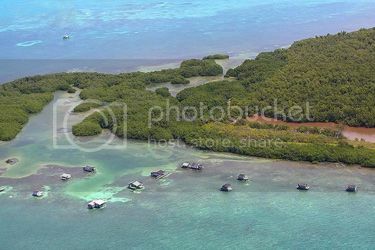 I helped some French people the other day find a scuba diving trip to Banco Chinchorro, and they came back and told me how much they loved it. I also hooked a guy from England with some dives while he and his family were in town. We also are getting more European families this time of year than we have in the past. I have met several different European families here lately, where in the past I mostly dealt with single Europeans traveling in pairs or together in a group, I am now meeting a lot of husband, wife, and kids. I like this time of year here because of all the people I get to meet from countries all over Europe and the world. 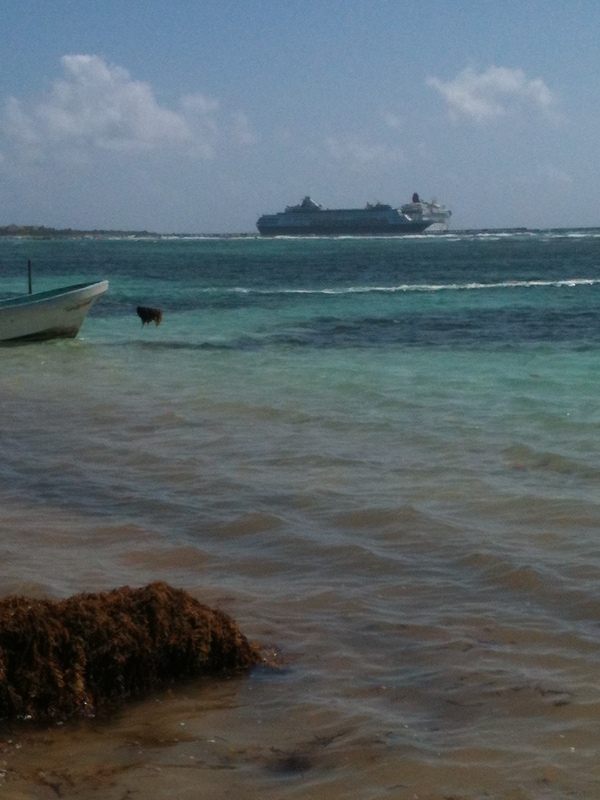 May and June are great times to come and visit Mahahual and Costa Maya. Things slow down, rates in hotels are cheaper, and there are always different people traveling through Mahahual on their way to someplace else. 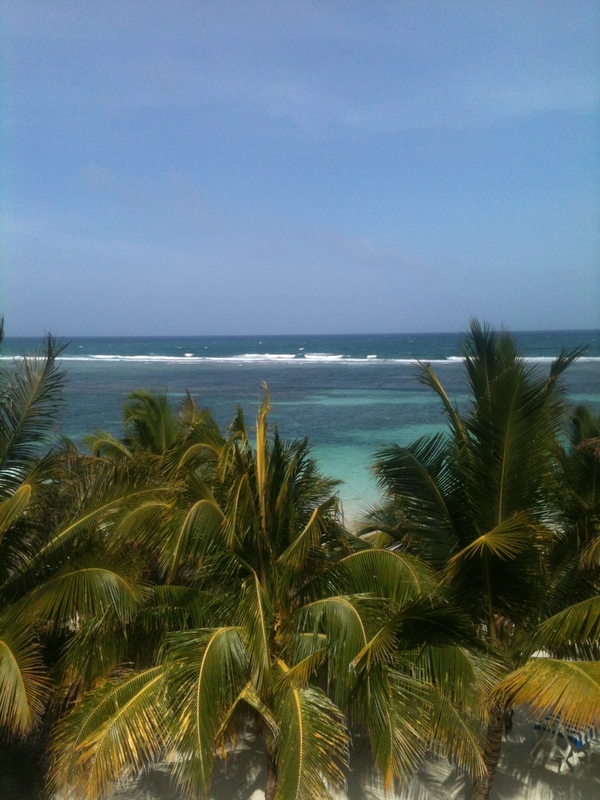 I have several people coming down in May and June to look at maybe buying some property or a home in Mahahual. 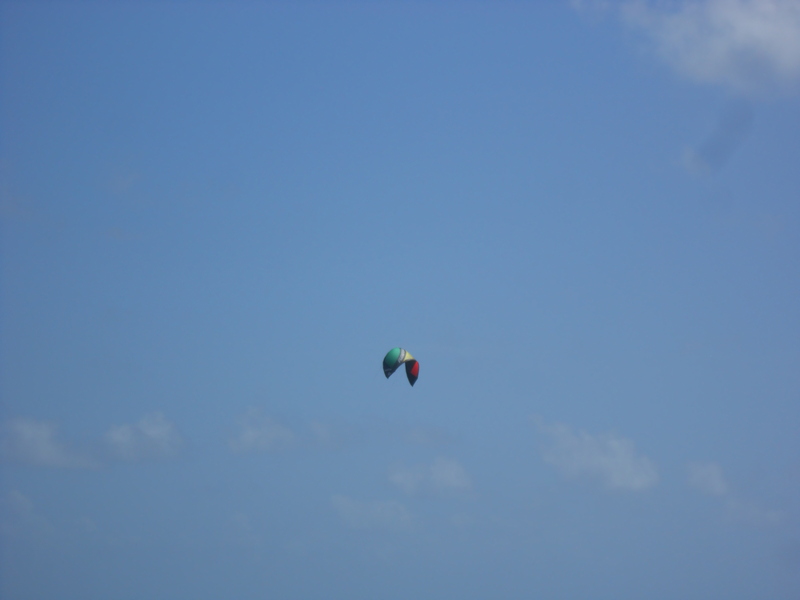 Now is the time to come to Mahahual because the weather is not that hot, and rainy season does not start for quite awhile. Over the next couple of days I will be doing some articles on things to do in the summer in Mahahual, and some specials on hotel rooms, and different things during low season that you might want to take advantage of. 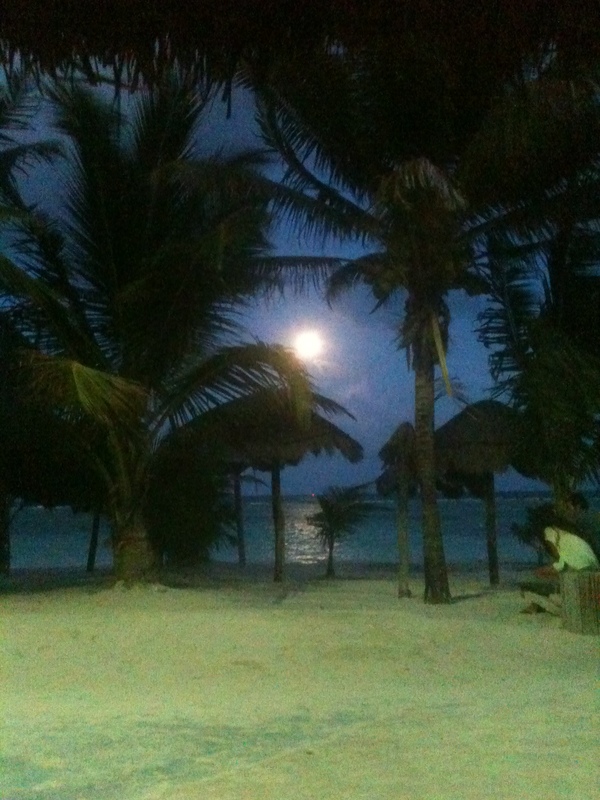 So if you have ever thought of maybe visiting or coming for a vacation in Mahahual, now is a great time. I will be here, Europeans will be here, and the beaches will be here waiting on you. In fact I can guarantee you, your own private spot on the beach with no one to bother you, just sun, cool breezes, and sand.